Every President from John Adams to George W. Bush has had the same mailing address, and this upbeat documentary is a look at the history of 1600 Pennsylvania Avenue. The White House doesn't get the Ken Burns treatment, though; this is a pretty starry-eyed and star-filled hour. It's history without politics, the story of America told via real estate and interior decorating and flatware and silver patterns. Martin Sheen is your host, and he narrates as a handful of notable actors read the correspondence of Presidents, First Ladies and White House employees—all the actors are on screen, looking into the camera and reading from leather folders, giving this the feel of a Fourth of July pageant. 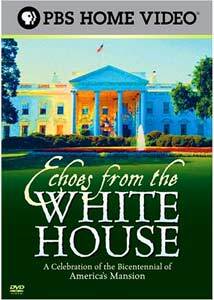 Philip Bosco makes for a redoubtable John Adams, with Dianne Wiest as his faithful Abigail; Blythe Danner reads the words of Dolly Madison, writing about the White House being burned down during the War of 1812. The film is crammed with lots of old drawings and lithographs; we see Andrew Jackson turning the residence into the people's house, allowing any citizen to come on in and give the President a piece of his mind, and hear from the writings of the White House servants on the fateful night that the President and Mrs. Lincoln went to see Our American Cousin. There's the usual squabbling you find around any house, even if it's the President's; Theodore Roosevelt had to defend fiercely the installation of a tennis court, for instance. The film gallops through a lot of history, discussing Woodrow Wilson's stroke, FDR running Word War II during no ordinary time in the West Wing, and Harry Truman overseeing a major reconstruction. Barely rating a mention is Jacqueline Kennedy, who made the refurbishment of the White House a pet project; more time is devoted to Richard Nixon and the dark days of resignation. Produced in 2001, the documentary ends with an appropriate image, from the day of George W. Bush's first inauguration; Bill and Hillary Clinton greet George and Laura Bush, the domestic face of the orderly transfer of power. Sheen calls the White House "the chief symbol of our democracy," but it's hard to argue persuasively that it outranks the Stars and Stripes, or the Liberty Bell, or the Statue of Liberty, or any of the many monuments and memorials in our nation's capital and throughout the country; still, it's a house worthy of respect, and it gets it here. Image Transfer Review: Video quality is a little flat and muddy; pretty run-of-the-mill stuff here. Audio Transfer Review: It's all appropriately audible, though there's a certain amount of hiss. A brief, chipper look at the President's home; it's full of patriotism, but not a whole lot of information.